Hear Christmas classics in a whole new way! Are you looking for a unique and exciting twist on classic Christmas carols? Look no further. 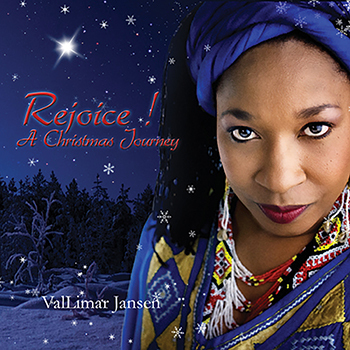 ValLimar Jansen's latest collection for Advent and Christmas season will have you singing along with these familiar songs in a whole new way. Working with her talented husband, Frank Jansen, ValLimar has succeeded in bringing us an innovative and contemporary take on songs like "Go Tell It on the Mountain," "What Child Is This" and "God Rest Ye Merry, Gentlemen." Featuring a wide range of musical styles—everything from cinematic and reflective classical sounds to invigorating and energizing rock and urban stylings—the collection is a breath of fresh air during the winter season. Throughout the collection, funky rhythms and counter melodies abound. "Silent Night," for example, starts out soft and simply, but the surprise comes half-way through when the rhythm picks up and "The First Noel" is added as a counter-melody. Of special note, ValLimar and Frank's arrangement of the ancient "O Come, O Come, Emmanuel" melody will absolutely take your breath away. It is a definite must-listen! Burleigh Drummond of the band Ambrosia is another highlight, making an appearance on the drums throughout the entire collection. Have a listen to "Little Drummer Boy" to hear this multi-talented artist's exquisite percussion skills. From the first song to the very last, Rejoice! A Christmas Journey is pure artistry.